What is the Nahdi Online Store? Nahdi Online Store is a website, where customers can buy medicine and a variety of other products that don’t need prescription, which are available at Nahdi pharmacies. What is the “Click & Collect” service? The “Click & Collect” service enables customers to buy products from the Nahdi Online Store, select a payment method (online or pay at the pharmacy when picking up the products) and select the pharmacy to pick up the products. 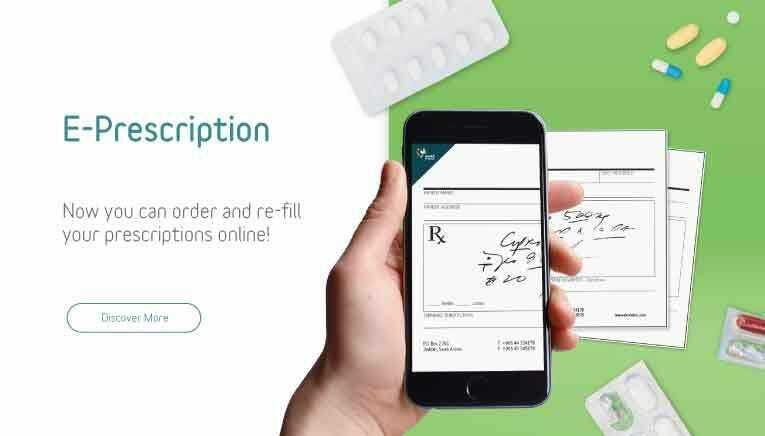 How can I pick up my order from the pharmacy after placing my order online? And What documents should I bring with me at the time of my order pick up? How long will my products be held at the pharmacy? Your products will be held in the pharmacy for 24 hours if the order is cash on delivery or 5 days if paid online . The order will be cancelled, if the products are not picked up within the scheduled time. What should I do if I receive an incomplete product? Sometimes certain products might be available online, but not in the pharmacy. In such a case, we only cancel products that are not available and send you an SMS mentioning that your order is ready, but some products are not available. We also send you an email containing all the relevant details. After checking your email, if you are sure that no product was removed from your order and you ordered all your required products, but some products are missing, please contact our guest care center on the toll free number 8001191198 for assistance. Before calling us, please check your email to make sure that all the products were ordered. Your order list will include all the products you ordered. Payment will be made only for the pick up products and you will earn Nuhdeek points accordingly. You cancelled the order yourself. An error occurred in product pricing or description. An error occurred in the payment. Where can I find information about Nahdi services? Tips and advice from health and beauty experts. How can I find information about Nahdi pharmacies location and working hours ? Each Nahdi pharmacy has different working hours. That’s why, we advise our customers to use the “Pharmacy Locator” option on Nahdi website to find about specific pharmacy. Please note that you should click on the details of a specific pharmacy to know its working hours. When will the products be available in stock? We regularly deliver shipments to our pharmacies. Products are often available in the pharmacies within a week. Please check the website regularly. When products are available, the icon “Add to Shopping Cart” will be displayed next to the product. If you add a product to your shopping cart and it becomes not available, you won’t be able to complete your order until you remove the specific product. If a product becomes out of stock after you add it to the shopping cart, you won’t be able to complete your order until you remove it. If it was ordered already and gets out of stock, you will be notified through an SMS about the non-availability and more details will follow in an email. If a product is out of stock, you won’t be able to order it. How do I see my previous shopping cart? You can see your previous shopping cart from the account details page on the website, which shows all the details of your purchases. How can I return products either purchased from the store or via Nahdi Online Store? If the product does not match your order or you need to return or exchange the online purchased items ,please visit any Nahdi pharmacy with the purchase receipt within 7 days from the date of purchase. What is Nahdi return policy? Purchase invoice is necessary for return services, within 7 days from the date of purchase. Items must be in their original condition unchanged (such as color change or damages). In the case of returning offer items: the entire range of offer must be returned in its value at the time of the offer. If the barcode is removed or cleared (for pharmaceuticals only). Items that require special storage conditions such as refrigerator medicines and baby food. Products supplied by health insurance. Maternity clothing for public health purposes. How can I contact Nahdi customer service? What are the terms and conditions for buying items subject to offers? In free gift offers and packages, the lowest priced item is offered free of charge. Wholesale purchases are not allowed, and Nahdi Medical Company has the right to determine the amount of products allowed for a single purchase. Some of the items offered and free gifts are available in selected pharmacies and the offer is valid until the quantity runs out. If there is more than one offer on the same product, only one offer is applied. In case of returning 1+1 or 2+1 items, or discount on the second piece returns, the whole set of products must be returned. To buy the medication of permanent diabetes (chronic disease), do I need a new prescription every time? You can have a 3-6 month supply on your prescription pursuant to prior approval of the insurance company. In such case, your prescription will be replaced with the approval document. Do I need a prescription to get my medication dispensed? As per the instructions of the Ministry of Health, each patient has the left to access all the information about his/her treatment plan, including information about medications. Does the insurance company have to approve the prescription fills? Your filling prescription generally depends on the approval of your insurance company. For how long can I dispense my medication with the original prescription? 3 months maximum for the medicines of chronic diseases, such as hypertension, diabetes and asthma. 1 week maximum for the normal medication, such as cough and flu. Does the deductible represent a part of the amount paid during the review as in the hospital’s pharmacy ? Yes, when receipts are submitted. What are the networks 5, 6 & 7? Networks represent different levels of coverage within the same scope. The bigger the network, the more service providers (hospitals or medical centers) it contains. How can I know if I’m eligible for the service or not? Please contact the customer care representative of your insurance company to verify your eligibility. What benefits will I get on filling my insurance prescription at Nahdi? Care and tips on medicine usage at the Nahdi pharmacies. Patients save the time and effort spent in hospitals. We guarantee the availability of all your needed medicines at the Nahdi pharmacies without the need to opt for alternatives. Which pharmacies are providing the insurance service? How to join Nuhdeek Clubs? To enjoy the benefits of Nuhdeek clubs (such as Health and Wellness, Beauty and Mom and Baby clubs) you have to be enrolled in the program. We will send you clubs details through your preferred channel. If you return a product for a refund, we will deduct the number of points collected from your Nuhdeek account. Return will not be accepted unless customer provides the original invoice or the invoice number available in nahdi pharmacies smart mobile application. With every Riyal spent, you will collect one point minimum that gets credited to your membership account within 24 hours from the transaction time. Extra points can be collected from nuhdeek points boosting offers. Points can be collected on all items purchased from the participating pharmacies. You can claim transaction points that has not been added to your membership account within one week from the transaction date using the transaction receipt. Points can be collected during promotions. Points can’t be collected on transactions paid by using vouchers. Points can’t be collected on redeemed points with transactions paid for in full or partially using redemptions. To redeem your points, your Nuhdeek membership must be activated. Once you reach 1000 Points, you will be eligible for redemption. Minimum redemption value is 10 SAR. Nahdi Medical Company and its partners reserve the right to verify membership ownership during points redemption by requesting a one-time password that gets sent to the mobile number registered in the membership or by nahdi mobile application. Vouchers are valid for one time use only and it should be used anytime before the expiry date. Unutilized expired vouchers cannot be accepted or reissued. Vouchers cannot be returned after issuance, and cash refund is not available if the purchased product is of a lesser value than the voucher amount. Collected points on active memberships are valid for 12 months for every purchase made. Points collected on new non active memberships are valid for 30 days only. Noncompliance to these terms and conditions, misusing membership benefits or providing false information will result in terminating the membership. Nahdi Medical Company and its partners can cancel, withdraw or alter nuhdeek program, including these terms and conditions, any nuhdeek clubs or any nuhdeek membership, at any time without prior notice.